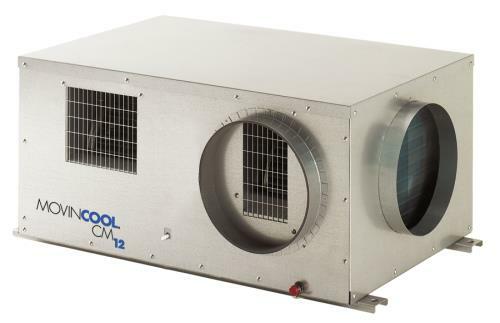 Providing 10,500 BTU/h of cooling, the CM12 is the ideal air conditioner to cool gardens. The CM12 uses a low profile design allowing it to fit in tight spaces. No 3rd party installation required. Just hang it, duct it, wire it in, turn it on and you’re done. It's that simple (duct required in all cases). The CM12 features easy-to-use Millivolt thermostat (not included). There are many of easy to use accessories that allow you to adapt the CM12 to your particular garden design. Power: 1 phase, 60 Hz, 115V power. Dedicated circuit with 15 amp max fuse protection recommended. Typical power consumption during operation is 11 amps and 1230 watts. Unit weighs 123 lb unboxed and 137 lb boxed. Unit dimensions are 32 in W x 20 in D x 15.2 in T without flange. Operating conditions are 65° - 113° F. Max Duct lengths are 10 ft on condenser (hot air) and 20 ft on supply air (cold air). Noise level is 52 dB(A).